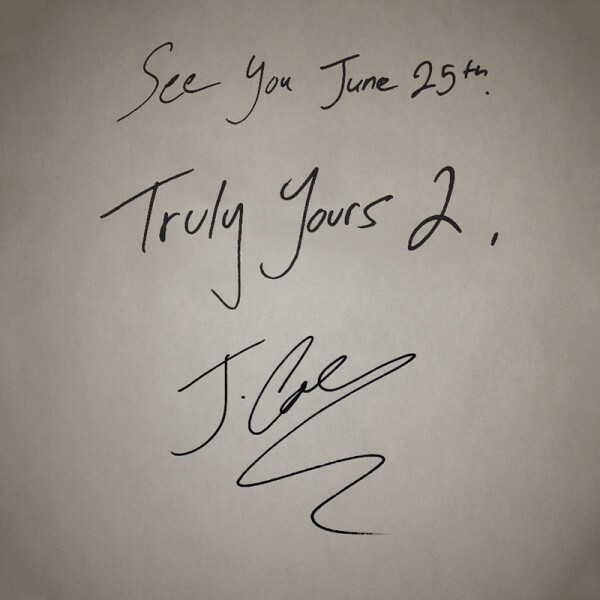 Monday night J. Cole released a record track titled 'ColeSummer' and the news he was releasing a new EP, Truly Yours 2. As promised, Cole delivers, 'Truly Yours 2' comes packed with 6 short and sweet previously unreleased tracks with guest appearances that includes 2 Chainz, Young Jeezy, and Bas. Production is handled by Canei Finch, Jake One, and J. Cole himself. Jermaine certainly knows how to release music in a rather unique way, his sophomore album, Born Sinner, is due in stores June 25. For now, you can listen to and download Truly Yours 2 below.